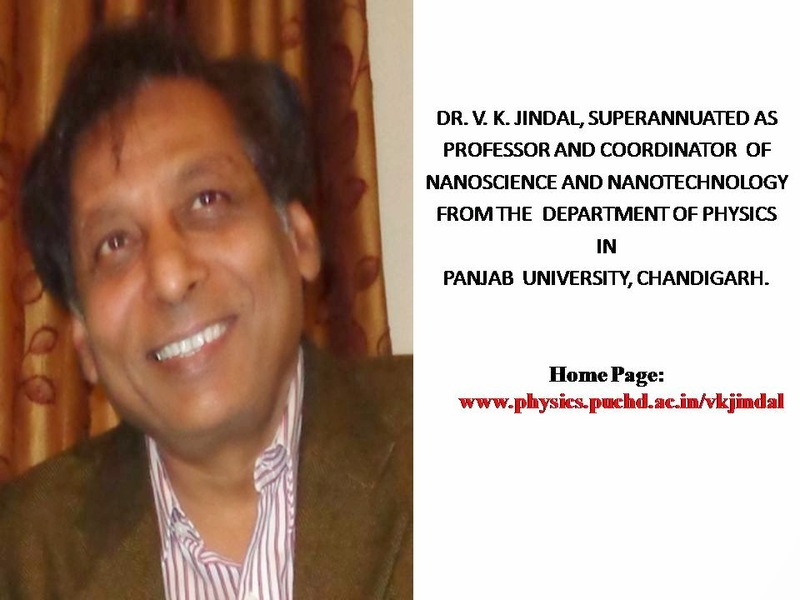 KNOW ABOUT EMINENT RESEARCHERS: DR. V. K. JINDAL, SUPERANNUATED AS PROFESSOR AND COORDINATOR OF NANOSCIENCE AND NANOTECHNOLOGY FROM THE DEPARTMENT OF PHYSICS IN PANJAB UNIVERSITY, CHANDIGARH. 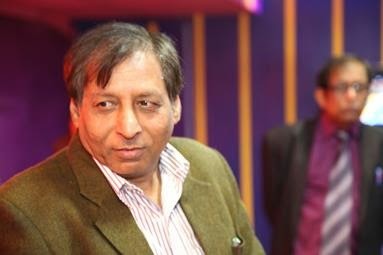 Superannuated as Professor and Coordinator of Nanoscience and Nanotechnology from the Department of Physics in Panjab University and is now a contractual Professor. · Third World Academy of Science (TWAS) awards scheme grant from Italian Government and visited University of Florence for one year in 1987. · BMFT (Ministry of Germany for Research and Technology) research professor positions holder in Germany lasting over two years in 1980 and over one year in 1988. · Visiting Fellow Jawahar Lal Nehru Centre, IISc, Bangalore (1993). · National Speaker under Theoretical Physics Seminar Circuit (TPSC) in the year 1993. · Deuscher Akademischer Austauschdienst Senior Visiting Scientist in1995. · Fulbright Fellowship award of USA, visited University of Illinois at Urbana-Champaign under this in 1996. Delivered special C.V. Raman Memorial public lecture on National Science Day at SMVD University, Katra on 28th Feb., 2009 under nomination by USIEF and Fulbright foundations. Prof. V. K. Jindal has published about 200 papers in international journals and conferences and symposia and headed research group and guided over a dozen Ph.Ds’ and over 3 dozen M.Techs’ and continues guiding research activities of the group. He is exposed to research in experimental and theoretical physics at highly established labs of the world like at Institute Laue Langevin (ILL), Grenoble and KFA, Julich. He has headed the condensed matter physics research group in physics department at Panjab University for over 10 years. As far his research credentials, Dr. Jindal has shown great deal of passion for independent research, venturing into new areas from time to time ranging from, quoting a few 1), modeling line widths and shifts for molecular crystals incorporating phonon-phonon interactions, 2), measurement of phonons in these using neutron inelastic scattering experiments at ILL, Grenoble, 3), suggesting new idea on shock heating in molecular solids, 4), alignment of micellar solutions through shear gradient and measuring the transformation through Small Angle Neutron Scattering Experiments at ILL and Julich, to finally, his work on new materials i.e. 5), theoretical and experimental work on new carbon based materials like fullerenes and carbon nanotubes. His work on measurement of phonons in the molecular crystal of anthracene using inelastic neutron scattering at ILL, Grenoble in temperature domain from around 4K to room temperature in early 1980s (Journal of Physics C-Solid State Physics 1982) while on a visit to Germany as a Humboldt fellow was an important early contribution after his doctoral degree and generated significant interest as it analyzed inter and intra-molecular modes in molecular solids and their temperature dependence. This not only paved the way for his enormous calculation exploiting anharmonic interactions to program for computing line widths and shifts, which he followed up for naphthalene, (Journal of Physics C-Solid State Physics 1983 and Physica Status Solidi B-Basic Research 1986) but also led to further interesting work on heating in molecular solids under shock compression. He introduced directional or anisotropic Gruneisen constants in naphthalene for the first time to formulate direction dependent heating under shock compression- the work he reported while he was a Fulbright fellow at University of Illinois, Urbana-Champaign (Orientation dependence of shock-induced heating in anharmonic molecular crystals, Journal of Applied Physics 1998). This was being explored to understand a basic problem in Physics- how materials break under pressure and how to control or prevent them from breaking. Apart from his work on inelastic neutron scattering, his well cited work has been reported on using Small Angle Neutron Scattering again at Grenoble as well as Julich during the intervening period ( J. Phys. Chem. , 1990, 94 (7), pp 3129–3138) on Rodlike Micelles in a Surfactant Solution. This very interesting real time dependent study providing transient data on shear induced possibility of alignment of micelles manifested by the experimental results depicting the anisotropy of intensity on neutrons collected on a 2-D detector on application of shear in a time span of a few seconds. Indeed they are also planning to use shear gradient to align carbon nanotubes in polymer solutions in his recent visit to TU, Berlin as a revisit Humboldt fellow (2012). As far his recent research in India as a group leader, his research extended to new areas which impacted condensed matter research with the discovery of fullerene molecule and their solids. He published interesting work on a simple model based on atom–atom potential (IJMPB 14, 51-68 (2000)) to provide an understanding of various bulk, structural and thermodynamic properties of pure C60 solid. This was during initial development of theoretical models for C60 solid and paved the way for a study of doped fullerenes, polymerized C60 systems and higher fullerenes as well as carbon nanotubes. As a consequence the subsequently important contribution which followed was an experimental work on polymerized C60 systems through Swift heavy ion induced modification of C60 thin films using facilities at IUAC, New Delhi. Modification of thin film samples of C60 on Si and quartz substrates, induced by irradiation of 110 MeV Ni ions at various fluences, was studied(JAP 94, 326-333(2003)). It was ably concluded from the Raman data and band gap measurements that swift ions at low fluences result in aggregate formations involving multiple molecular units such as dimers or polymers, whereas, high fluence irradiation results in submolecular formations and amorphous semiconducting carbon, indicating overall damage (fragmentation) of the fullerene molecules. As regards follow up to carbon nanotubes, very interesting and new results were obtained leading to an explanation of behavior of all types of carbon nanotubes in single and multiwalls materials under hydrostatic pressures including structure and thermodynamics resulting in most cited work on Elastic moduli of single-walled carbon nanotubes and their ropes, (Phys. Rev. B 72, 165428 (2005)) including that for boron nitride tubes (Nanotechnology 18 (43), 435711, (2007)). More importantly, it was pointed out (in contrast to general assumption) that two bond lengths instead of one is necessary to properly describe the structure of single wall carbon nanotubes of armchair variety. A study under hydrostatic pressure led to the conclusion that these two bond lengths tend to approach each other under pressure, becoming equal at some critical pressure values which is a function of tube diameter ( Phys. Rev. B 76, 195447 (2007)). Further study was extended to zigzag and chiral nanotubes and different salient features were observed(CARBON 47,3247–3251 (2009)). Indeed, motivated by these, the group of Prof. Alfonso San Miguel in Lyon probed the predictions in their experimental study on high pressure properties of single wall carbon nanotubes through fullerene encapsulation, using Raman Scattering under pressure (Phys. Rev. B 77, 125418 (2008)). Finally, I would also like to mention another important recent work by Dr. Jindal and his group. He introduced endo and hetero impurities in the form of N and B atoms on and inside the C60 cage and studied various structural and electronic properties using density functional theory (Structural, Electronic, and Vibrational Properties of C60−nNn (n = 1−12), (J. Phys. Chem. A, 113 (31) 9002–9013 (2009)). An important result to my mind was suggesting the possibility of trapping upto 12 N atoms in the cage and thus forming singly bonded N complexes which is not possible in free space. This complex will be stable in free space only in triple bond state and thus a huge amount of release of green energy is postulated(J. Phys. Chem. C, 114 (19), 9153–9160 (2010)). His experiment suggesting application of magnetic field to enhance the quantity and quality of carbon nanotubes in the setup of Biro et al (Chem Phys Lett 2003:399–402) met with good success ( reported 2007 Nano Trends: 2, 48-59).